Once, an annoying, young lawyer crashed the party. Upon learning that I was a journalist, he wanted me to write a story about "the hooking up that goes on at conferences." I told him that it would be impossible to do that article, because such things never happen in the videogame industry. He was dogged, but it was difficult to hear him over the pulsing music. All videogame industry parties have blasting music. The strange part is this: no one likes the loud music. No one makes use of the dance floor. In a European discothÃ¨que, I remember trying to have a conversation with one of the smartest magazine editors in the business. She was describing her theory of avatars. It was hard to hear over the sound system. Then a PR woman flitted by and asked why I wasn't dancing and disappeared into the crowd. The editor and I decided to finish our conversation outside. "I didn't come 400 miles to dance," she said. "I came here to talk." I agreed, and I'd traveled 5,000 miles. It was one of the great sins, she observed, because, "people came here to talk." Conversely, I once traveled to London just for music - in this case, to cover a concert featuring a full orchestra performing themes from Halo, Metal Gear Solid and dozens of others. That was an evening to remember. Sony's Phil Harrison told me he enjoyed it, just days after PS3's launch. 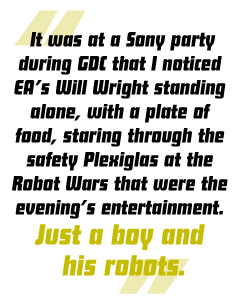 It was at a Sony party during GDC that I noticed EA's Will Wright standing alone, with a plate of food, staring through the safety Plexiglas at the Robot Wars that were the evening's entertainment. Just a boy and his robots. And everyone else was crowded around the open bar. There are indeed secret, elite and premium conferences, too. Some are merely exclusive, some specialized, while others are actually kept secret from the rank and file. The DICE Summit is held at a resort far away from the Las Vegas strip, where top publishers and developers gather to relax and talk business. While the summit isn't a secret at all, attending is a rare privilege. In March of 2007 there was a copy of the event called GDC Prime. Unlike DICE, the press was restricted from covering any sessions of the executive conference. But in the lobby, some attendees reported they only signed up because Prime gave them a premium pass for the concurrent GDC and a room at the conveniently located W Hotel, as part of their registration package. The press is quite used to covering panel discussions, but the PR for Games conference, hosted by game industry firm Kohnke Communications, is quite a switch. Journalists are put in the hot seat, and get to answer questions from a room full of public relations professionals. It proves more interesting than uncomfortable. San Francisco is also the location of a group of industry insiders who formed a club to gather regularly for supper. Every couple of months, they'll arrive one by one at a premiere steak house. The membership rolls include the movers and shakers who make things happen: publishers, developers, hardware and media companies. Project Horseshoe is one event that keeps attendance below 50 people, and they gather "to answer game design's toughest questions." Sequestered in the Texas hills, media attendance is completely prohibited, although The Escapist was allowed to report from the scene this year.